A Personal Loan is a loan with no restriction on the purpose it is used for. It can be easily availed to help in an immediate cash crisis and is sanctioned much faster than any other loan. The life cycle involves borrowing money from the lending bank and paying it back with accrued interest over a pre-decided time period. A personal loan EMI calculator is a tool that enables the borrower to calculate the EMI or Equated Monthly Installment amount that a personal loan borrower has to pay. The EMI is paid throughout the tenor to repay the personal loan amount to the lending bank or institution. The calculator helps you make an informed choice to meet your financing need and shows the best personal loan offers based on your requirement and eligibility. Fixed rate loans – The interest rate is fixed, and there is no change to the equated monthly installment throughout the loan tenor. Variable rate loans – Interest rates are tied to MCLR or benchmark rates which have a direct impact on the interest rate. Hence, EMIs can vary over the loan tenor. Debt consolidation loans – Instead of making multiple payments, turn all your loans into a single personal loan. With this loan, only monthly repayment is required. Line of credit loans – Instead of getting a lump sum amount, the lending institution opens a line of credit. You can avail the loan as per requirement and pay interest only on the amount used. Short term loans – Some individuals may want a loan for two-three months. Repayments are linked to paydays. Some lenders are willing to take a piece of art or jewelry as collateral to provide a short-term personal loan. Credit cards, cash advances, and balance transfers – You can get cash advances on credit card limits or shift from one credit to another to balance transfer. Though this meets immediate cash requirements, the rate of interest is usually high. Co-sign loans – In cases, where borrowers creditworthiness does not meet the bank’s standards, a co-signer with a high credit score pledges to pay-off the loan if the borrower defaults. The rate of interest is a primary factor that drives your decision to take a personal loan from a particular bank or institution. The interest rate is always given as an annual rate and monthly EMI is required to be calculated based on this interest rate. Given below is the formula is used to calculate the same. This means that the rate of interest per month will be 1.5%. E is the actual EMI that you will have to pay. Once all the relevant details have been entered into the calculator, it tells you the amount that you would require to pay every month as EMI for the personal loan. As mentioned above, the Personal Loan EMI Calculator is a tool that enables the borrower to calculate the EMI or Equated Monthly Installment. The EMI is an amount that a personal loan borrower has to pay throughout the loan tenor in order to repay the personal loan amount to the lending bank or institution. Interest Rate – Every lending institute levies a rate of interest based on the MCLR rate. However, there are discounts and other offers available based on the factors mentioned below. Tenor – The longer the tenor the higher is the EMI a borrower is liable to pay. Principal Amount – Borrowers need to keep in mind that the higher the personal loan amount they avail, the higher will be their EMI. Hence, it is a good idea to use the personal loan EMI Calculator to calculate the amount you can pay back comfortably. Credit Score – Your CIBIL score determines your credibility, and a higher score means lending institutions are willing to give a higher principal amount at a lower rate of interest. Borrowers Eligibility – Your eligibility which includes your employment history, location, etc. can also have a direct impact on the principal amount and interest rate. The tool has been devised to be easy to use and you can input multiple to calculate what suits you best. It helps you access your repayment capacity by displaying the monthly EMI for repayment. Calculating the personal loan EMI excel or online is recommended over manual calculations. Manual complications are complicated and not easy. Therefore, the use of a personal loan EMI calculator comes really handy for the ease of calculating the personal loan EMI. It helps to save your precious time while providing accurate results. The calculation of the EMI can also be made using an Excel spreadsheet. But to do so you need to be an expert in using an Excel spreadsheet. Personal Loan EMI calculation tool saves you from all these hassles but just filling the required fields. What’s more, it is accurate and eliminates errors in the calculation without giving you any stress. 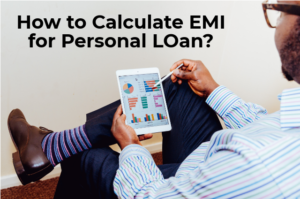 The personal loan EMI calculator allows you to fill multiple inputs. It helps you know the amount required to repaid monthly in a few seconds from the comfort of your own space without visiting a bank or a financial institution. The monthly EMI gets calculated and automatically displayed the moment you enter key details of your loan, like loan amount, loan tenor and interest rate. This personal loan monthly EMI is an important factor in deciding the loan amount which you are comfortable in repaying each month. Change the loan amount or tenor to arrive at an EMI you are comfortable to repay every month. Thus, personal loan EMI calculator is also a tool to help you access your repayment capacity. After calculating the EMI using the Personal loan EMI calculator you can click on “Get Quotes” tab to view a comprehensive list of the best personal loan offers available in the market based on your requirement and eligibility. By comparing the offering from various financial institutions and banks you may decide to choose your best option. The rate of interest calculated on a personal loan with the help of a personal loan EMI calculator is determined by certain factors, such as the amount of the loan, the duration of the loan, the income of the loan applicant, etc. The rate of interest can vary for two people with a similar profile. Different banks and financial institutions charge a different rate of interest that may be fixed or floating. 1. Is there a difference between online and excel sheet calculator results? No, there is no difference between the results of the two calculators – if you use both of them, the result should be the same. However, if there is a difference, then you need to check the formula used in the excel sheet for its correctness. 2. What is the accuracy of the EMI online calculators? Personal loan EMI calculators provide a high level of accuracy in calculating the EMI. But, it is always a good idea to ask the lending institution the exact amount before finalizing the loan amount or lender. 3. Is it a good idea to use the calculator before applying for a loan? Yes, it is. For the simple reason, you can fill in your details and calculate your EMI. Change the loan amount and/or tenor to know which EMI most suits your income. This way, when you approach the bank you will know your repayment capacity. 4. How does the EMI remain the same throughout the tenor? Initially, the personal loan EMIs contribute more towards the payment of the interest as compared to the principal amount. It’s only in due course of time during the tenor of the loan that the subsequent EMIs begin to contribute towards the repayment of the principal amount. EMI calculators take this into account while computing your monthly installment. The amount charged for processing the loan application is called the processing charges. In most cases, it is non-refundable. The charges may vary from bank to bank. It is generally 1-2% of the total loan amount. A fixed rate is decided at the time of the sanction of the loan in case the borrower fails to make the loan repayments on time. The borrower should evaluate his repayment capacity by using the Personal Loan EMI calculator to get into such a situation where he is unable to pay the EMI. The borrower can change the mode of payment for ECS to Check or otherwise by paying a nominal fee. This charge is levied if the cheque towards the EMI bounces or dishonored for any reason. The service provider with an annual revenue of over 8 lakhs is liable to pay the Service Tax. The Bank loans fall under this category. It is charged to the bank on the applicable rate. We Help You To Calculate The Best Personal Loans Offers! A Loan EMI calculator eases the difficult task of calculating your EMI. It gives information about your loan repayment from the comfort of your home or personal computer. It enables you to calculate the EMI by giving accurate results based on the type of personal loan, amount of loan and tenor of the loan.